Angular Contact Spherical Plain Bearing GE.SX Series, it's axial thrust angular contact spherical plain bearing with groove and oil hole, requiring maintenance. Angular contact spherical plain bearings are complete units comprising an inner ring and an outer ring with a steel/steel sliding contact surface. The inner ring has a convex outer slideway. The outer ring has a concave inner slideway. 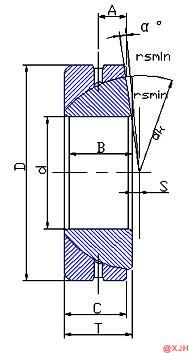 It can support axial loads as well as radial load, so they are thus suitable for alternating dynamic loads. Can transmit motion and loads with low moment levels, they can thus keep bending stresses away from the adjacent structure. To furnish the varying desires of our customers, we are immersed in offering a world class consignment of Angular Contact Spherical Plain Bearing GE.SX Series. With many years of experience and manufacturing facilities, we are able to tailor our services and products to meet the needs of our international clients. Bearing rings of carbon chromium steel, hardened and phosphated, sliding surface treated with MoS2, It has characteristics of wear-resistance, anti-corrosion and self-aligning, suitable for radial loads and single direction axial loads mechanism.